Solar Power News & DIY Solar Tips > Solar Facts & Figures > How do Solar Panels Work? Solar panels generate DC electricity when exposed to sunlight via the Photovoltaic Effect, first observed by a French physicist in 1839. A simple explanation is that the photons from sunlight are absorbed by a semiconductor material, generally silicon. The negatively charged electrons are knocked loose from their atoms, and flow from the negative side to the positive side to recombine with available holes there. This creates a direct current flow. This flow of electrons can then be used to either directly power a DC device, like a pump or a fan, it can be used to charge a battery bank, or it can be inverted to AC power to use in your home. Each one of these sections of a silicon is called a solar cell. A solar cell generates about ½ volt. That’s not much for practical use. So multiple cells are wired together in series to create higher voltage, creating a solar module, commonly referred to as a solar panel. A typical 12 Volt (V) solar panel has 36 cells in series. The larger a solar cell is, the higher the current. So the cells of a 200 Watt (W) panel are generally bigger than a 100W panel. Multiple solar modules wired together then creates a solar array. The more solar cells wired in series, the higher the voltage of the solar panel. You can see the difference in the look of a 36 cell 12V module compared to a 72 cell 24V module. As with anything, there are exceptions, but this is a good general rule. Open Circuit Voltage (Voc) is the voltage you will measure when there is no load on the solar panel, nothing but a voltmeter is connected to the solar panel and essentially there is no current flowing. This is the highest voltage the module will output when the solar cell is at STC. The voltage will be higher when it is colder out, and lower when it is hotter. Short Circuit Current (Isc) is the amps output with no load on the panel, just an amp meter. It is the highest current possible at STC. It’s the current you would measure in the wire if the positive lead of the solar panels was directly shorted out to the negative one. Voltage at Maximum Power (Vmp) is the voltage the solar panel is at when it is producing the most power (i.e. the sweet spot where this voltage multiplied by the current produces the maximum power) it can for the test conditions. Current at Maximum Power (Imp) is the the current output where the solar panel is producing the maximum amount of power. Nominal voltage is a way to categorize battery-based solar equipment. Because a higher voltage is required to charge a battery, nominal voltages are used to help see what equipment goes with what. So a nominal 12V panel actually has a Voc voltage of around 22V, plus or minus a volt or two, and a Vmp of around 17V. This difference often confuses people when they try to measure the voltage of a solar panel when it’s not connected to anything but a voltmeter. If you count the number of cells, it will likely have 36 cells wired in series. Likewise, a panel that was designed to charge a 24V battery bank will have a Voc of around 44V and a Vmp of around 36V. Counting the cells will come up with 72, twice as many as a 12V panel. If you wire two 24V panels in series, or four 12V panels in series, you can charge a 48V battery bank. This was all well and good for battery based systems, but then along came grid-tie systems, and since they don’t use batteries, 12, 24, and 48V became meaningless. So the industry sort of standardized on 60 cell, 20V nominal panels. Alone, they are too big to charge a 12V battery, and too small to charge a 24V battery. An MPPT charge controller solved that by reducing the voltage down to the required range, and in doing so, increasing the current output, so you are not losing power. You can see more on MPPT charge controllers in our MPPT vs PWM Charge Controller video . The demand for higher wattage solar panels has been increasing. 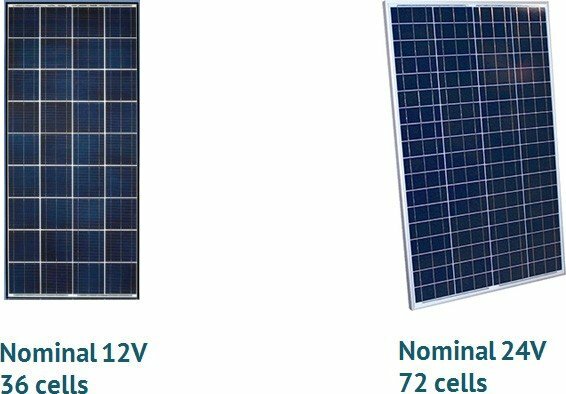 Many manufacturers are achieving that by increasing the number of cells, and in turn, increasing the voltage of the panels. As you may recall, watts equals volts times amps, so increasing the volts while maintaining the same amps increases the watts. As such, there are 80 cells and higher available these days. 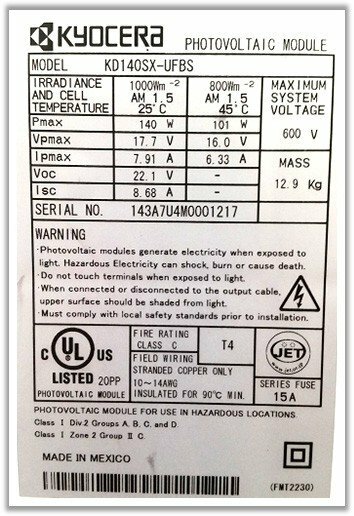 If the panel you select doesn’t say what its nominal voltage is, you can look at the specifications. A 24V panel has a Voc of about 46V, whereas a 20V nominal panel has a Voc of around 38V. You’ll need to know the nominal voltage of a panel when you are designing an off-grid solar system to ensure the input voltage is high enough to charge the battery bank, and to determine what type of solar charge controller you need. Be sure to check out our article on how to size a solar charge controller. We hope that helped answer some basic questions about solar panels. 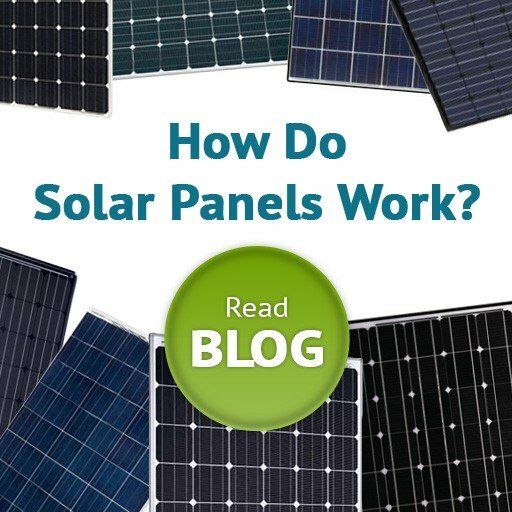 Check out more of our blogs as we cover more of the basics of solar electric systems.